It's been a profusion of young talent at the Bernabeu of late. The season begun with the high-profile acquisition of Colombian wonder boy Jamie Rodriguez in late 2014. Last week, it was the signing of the 16-year old Norwegian prodigy Martin Odegaard that created quite a buzz among Real enthusiasts. 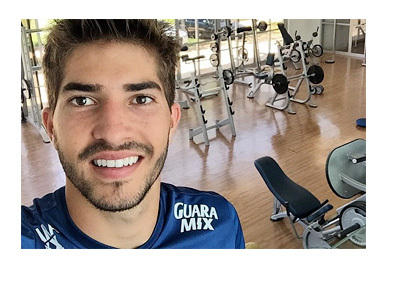 The latest in the line of such acquisitions is the 21-year old defensive mid-fielder Lucas Silva Borges from Brazilian club Cruzeiro. Born in Bom Jesus de Goias, Brazil, Silva made his first appearance for Cruzero in 2012 in which the club lost 2-4 in an away game to Atletico Mineiro. It was only after 2013, with the advent of Marcelo Oliveira as the coach, that Silva started being utilized considerably by his club. The highpoint of his tenure with Cruzero was his two goals in a 5-3 win against Vasco Da Gama in September that year. His side went on to become the champions of the Brazilian Serie A League. He became a regular feature in the Cruzero midfield and was elected the best player in that position in the tournament. He featured in as many as 58 games for his club and was instrumental in winning the Brazilian title for Cruzero again in 2014. Initially there was a talk of Real president Florentino Perez wanting to sign on attacking Borussia Dortmund midfielder Marco Reus but a 25 million Euro release clause was what put the Los Blancos off and the focus shifted to Lucas Silva. There were also rumors surrounding a possible move to Arsenal but Silva eventually opted for Real. Ancelotti had evinced interest in Silva way back in November 2014. With injuries plaguing Sammy Khedira and Luka Modric, Los Blancos were on the lookout for a reliable player to fill in their midfield ranks. The 15-million Euro Brazilian acquisition seems to be Real Madrid's answer to the problem. The unveiling ceremony of Silva will take place on Monday, 26 January, at the Santiago Bernabeu stadium where he will be presented to Los Blancos fans.